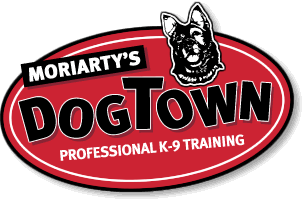 Certified dog trainer, Kevin Moriarty’s DogTown was created in East Longmeadow, MA in 1998, serving Western MA & Northern CT. His training philosophy is simple: Be firm but fair. Spend time working with your dog, it’s the best investment you can make. Figure out what you and your dog enjoy doing together, and get out there and do it! Your dog will be a part of your family for many years. You owe it to them to be a strong caring leader. Kevin will help you build a bond with your dog that will last a lifetime.